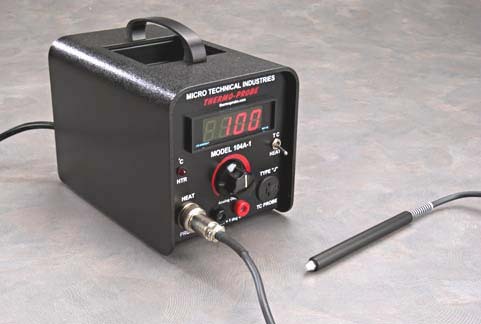 Model 104A-1 Thermo-Probe lets you heat-test Integrated Circuit components with constant ease and accuracy. No ovens, no heat chambers ... everything is in the open and easily accessible. Thermo-Probe applies heat that is +/- 1 degree centigrade accurate ... or better ... to integrated circuits, diodes, resistors, capacitors, transistors or any other type of electronic component. You pinpoint heat-drift and thermoelectric problems right on your test bench or production line. A reliable solid-state controller continuously monitors the probe temperature and regulates it to the temperature you set on the digital meter. It takes no more than seconds to bring the probe from ambient to 160 degrees centigrade. Thermo-Probe's Analog Output feature allows for recording of permanent temperature data. The data can be captured by Computer, Strip-Chart Recorder, X-Y Recorder, Data Logger and other instruments. Thermo-Probe Model 104A-1 is ideal for Design Engineers, QPL Managers, Technicians and Trouble-Shooters.